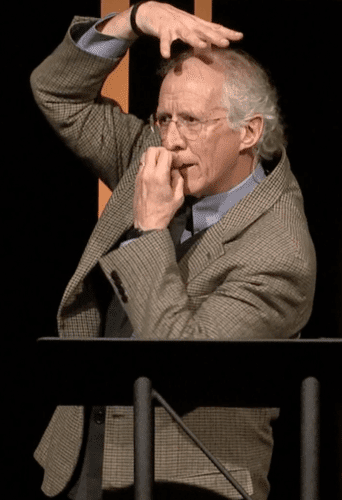 John Piper speaking at Sovereign Grace Churches Pastors Conference, 10-25-2016. John Piper, not unlike the charlatan Elmer Gantry in Sinclair Lewis’ novel of the same name, has once again demonstrated a notable lack of any decency, kindness or reason. Piper chose to speak, along with C.J. Mahaney, at a Sovereign Grace event this week. C.J. Mahaney, a man credibly accused of blackmail and covering up the sexual abuse of children in Sovereign Grace Churches is a good friend of Piper’s. They frequently speak at each other’s conferences, undoubtedly pocketing hefty honorarium fees in the process. 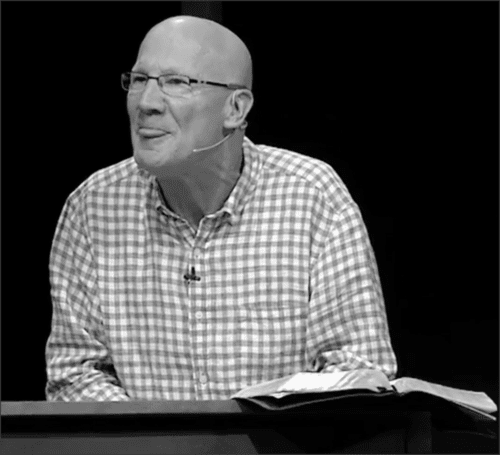 (Piper did have to remove Mahaney from his Cross Conference in December, 2013, due to negative press, but I would guess Piper still paid Mahaney the honorarium fee, after all what are friends for?) Piper has yet to show any concern for the multiple victims of sexual abuse which occurred while his good friend, C.J. Mahaney was the Executive President of the Sovereign Grace denomination and senior pastor of Covenant Life Church. 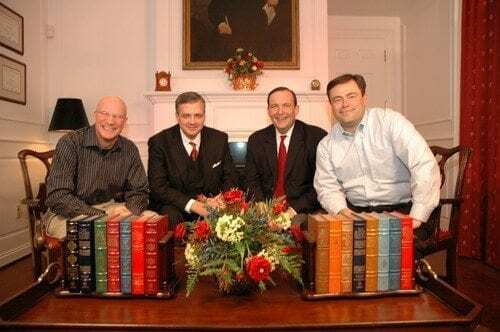 Shortly after the sexual abuse scandal became public, Mahaney fled Covenant Life Church, temporarily seeking shelter with another supporter and fellow conference celeb, Mark Dever, at Dever’s Capitol Hill Baptist Church. Mahaney, not one to be able to endure being out of the spotlight (nor the resulting cash) soon fled to Louisville to start a new church. 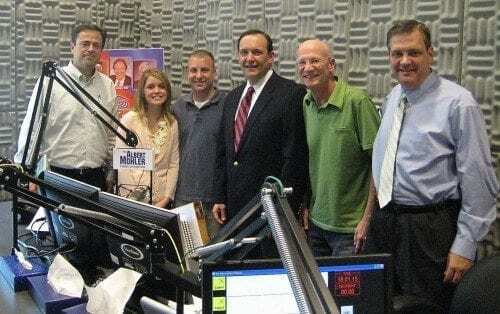 Never one to start humbly, Mahaney took four other pastors with him – his son-in-law, his brother-in-law, and his trusty yes-men, Bob Kauflin and Jeff Purswell. Initially they held services in a Christian school in Louisville, but when word of the sexual abuse scandal reached school officials Mahaney & company were given the boot. They quickly relocated to a hotel. Once Mahaney settled in he attempted to gain legitimacy by having all his famous friends stop by and preach. (Plus it gave a bit of a reprieve to the overworked pastoral staff of five.) Unfortunately, most of his friends were only too willing to lend their (good?) names to bolster the sagging reputation of Mahaney. It should be noted that all the men who spoke at Mahaney’s church were unable to honestly claim ignorance of the sexual abuse scandal and Mahaney’s cover-up. Brent Detwiler had emailed all of them detailed information on the subject. Detwiler deserves most of the credit for bringing this scandal to the light of day. His was a largely thankless task resulting in him being excommunicated and having the corrupt leadership of Sovereign Grace do everything they could to tarnish his name. 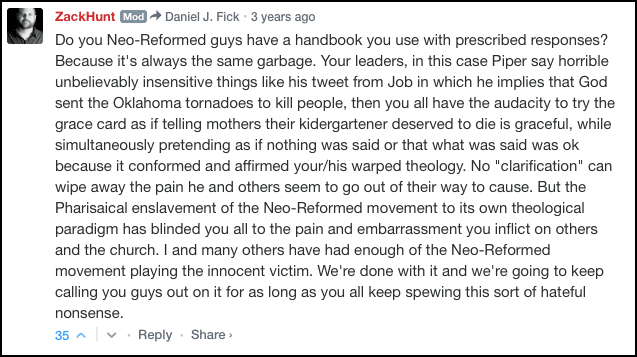 Below is a partial copy of the post Detwiler wrote after John Piper spoke at Mahaney’s run-away church plant. “Last Saturday night, I knew three things when I went to bed. One, John Piper was preaching at C.J.’s church in the morning. Two, John Loftness would be announcing his resignation in the coming week as Chairman of the SGM Board. Three, Craig Cabaniss had already resigned from the Board and was surveying his church about their future relationship with SGM. I did not know why Piper was visiting however. Just before I fell off to sleep, I texted a friend saying I feared Piper would endorse C.J. but hoped he was there to announce C.J.’s resignation as President of SGM. The next day my fears regarding John Piper were realized. He desperately wanted to preach at Sovereign Grace Church of Louisville (SGCL) in order to express his thrill and excitement for all things Sovereign Grace. …Before you given someone an unqualified endorsement you better do your homework. The scholarly John Piper has not done his homework in C.J.’s case. Or in the case of Sovereign Grace Ministries. He has talked to C.J. and his supporters but he has not studied the 2,500 pages of hard evidence presented against C.J. adn SGM. Nor has he talked to the 70 plus pastors who have severed ties with C.J. 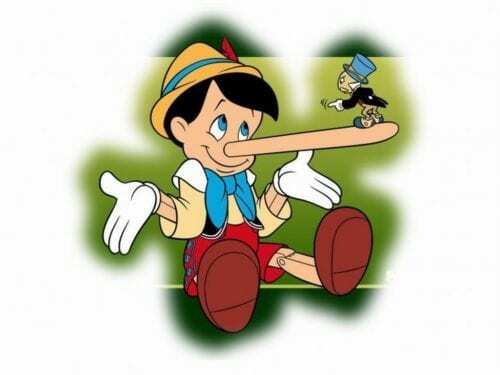 over the past 7 months due a lack of trust and serious concerns for the leadership culture he has created. Nor has he interviewed the devastated families and victims of sexual abuse in SGM. John said in his sermon he has never read the SGM Statement of Faith. I hope he has read the class action lawsuit with its 143 Complaints. I appreciate John Piper and I thank God for his theological contributions to the Body of Christ but he has blundered in this case. His personal affection for C.J. has exceeded his concern for the glory of God. God is disciplining SGM. Piper should be doing the same. It is disillusioning but here is what we learn. Not even John Piper is immune from playing favorites or being partial in his judgments. I’m am extremely concerned for the celebrity culture that exists among elite preachers in this nation. Whether in ignorance or not, John is covering up for C.J. when he and other national leaders should be dealing with C.J. in a forthright manner. This is one of the many comments I received this week in response to John Piper’s endorsement of C.J. and SGM. Thousands of believers throughout the world and in the United States feel the same way and are expressing the same sentiments. 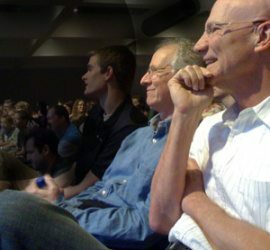 Are you going to address John Piper speaking at SGCL [Sovereign Grace Church of Louisville] last Sunday? I know you included him in your letter addressed to 70+ pastors/leaders of ministry but his recent remarks of support for both C.J. and SGM, well, frankly they make me want to cry. I have listened to John Piper’s sermons/podcasts for years and read most of his material. I can speculate as to why he is supporting C.J. and SGM but honestly I cannot understand it in my spirit. It is so grieving. You may read Brent Detwiler’s entire post here. Below are the introductory comments of John Piper at Mahaney’s run-away church plant. Piper “chose” to speak there in February, 2013. Below are some clips I culled from Piper’s sermon at the Sovereign Grace Churches Pastors Conference. Piper spoke on October 25, 2016, the entire sermon can be found here. If you listen to the five minute clip below you will find that Piper speaks about giving the Bible “functional authority” in the believer’s life. He says one must analyze every thought that comes into your mind prior to speaking or writing a word. He suggests asking yourself two questions about the thought in your mind prior to expressing it- is there a passage in Scripture that supports the thought, and is there a passage in Scripture that is contrary to the thought? Piper claims these are his two sentinels which he has been utilizing for forty years. He further states that if your thoughts cannot pass these two “sentinels” then you do not speak it or write it. It is my contention that John Piper is ill-suited to be teaching anyone on this subject. 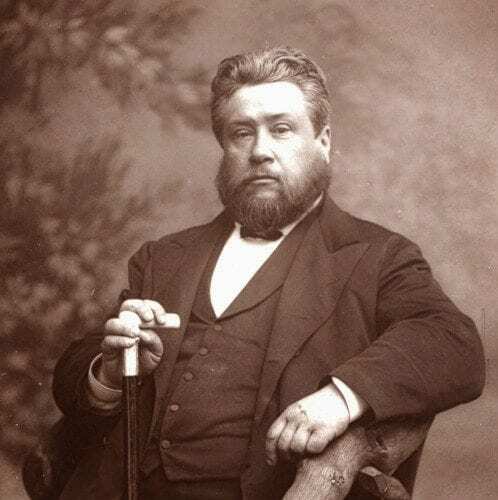 His words, both written and spoken, frequently do not seem to pass muster of the “functional authority” he claims he has been giving Scripture for forty years. Below are just a few examples I came up with after having conducted minimal research. “I have listened now several times to two messages from the 2008 Resolved Conference by CJ Mahaney and John Piper. The shocking phrase they both chose to use to describe Jesus’ finished work of redemption on the cross for the elect was, The Scream of the Damned. No, they are not referring to unregenerate people in hell, or the weeping and gnashing of teeth from perdition’s flames, but using this to describe the sinless, holy Son of God as our divine Substitute. The Lord Jesus Christ the Righteous now called: The Damned. This is unthinkable. Those words not only stunned me, but it did stir my interest afresh to go back and study again the atoning work of our Lord Jesus Christ on the cross with those provocative words in mind. Both of these men are good communicators; passionate about the things of the Lord; both strive to be biblical in their sermons; and both are men of God. As most know, Piper has a reputation for creating phrases for shock value and being provocative (i.e., anyone remember Christian Hedonism?). I am all in favor of being creative in our writing, but it must stay in line with biblical truth as well. There can be no artistic license when speaking of God, His attributes, His character, our Lord’s ministry, the cross, or the persons and nature of Jesus Christ Himself in incarnation for our redemption. We must pursue godly discipline with the purposed constraint to God and His truth that careful and circumspect study of Scripture affords when mining these great and essential truths of the Christian faith. In all of my research, I haven’t been able to find anyone who referred to Jesus’ suffering on the cross as “the damning of Jesus”; and not one early church father that referred to Jesus as “The Damned” when speaking of the cross and substitutionary atonement. If someone knows of any early church father (or anyone for that matter except Piper and CJ) who use the term The Damned to refer to the loving, holy sacrifice of our Lord Jesus on the cross, I would be most interested to see the source and context. Thank you. For context, CJ and Piper attribute the saying, “The Scream of the Damned”, to Jesus’ words on the cross: “And at the ninth hour Jesus cried with a loud voice, “Eloi, Eloi, lema sabachthani?” which means, “My God, my God, why have you forsaken me?” (Mark 15:34). Christ was forsaken as our sin-bearer and propitiatory sacrifice (Heb. 1:3), but this is not the cry nor the language of damnation. This is a quote taken from Psalm 22:1. In saying these words, Jesus is fulfilling the prophetic words of the Psalmist and declaring Himself to be the one true Messiah. He is also expressing the agony and mystery of enduring God’s wrath against us and our sins, so that we may have peace with God forever (Rom. 5:1). God forsaken of God… who can fully comprehend it? What great love by the Father (Rom. 5:8-9) and the Son (John 15:13) to endure such suffering for those He came to save (Heb. 2:9, Phil. 2:5-11). “Looking to Jesus, the founder and perfecter of our faith, who for the joy that was set before him endured the cross, despising the shame, and is seated at the right hand of the throne of God” (Hebrews 12:2). Amen? Do you think that this is a picture of Jesus being damned beloved, or it is a picture of humiliation, substitution, propitiation, redemption, justification, and imputation? Are these two things compatible or antithetical according to God’s Word? does the Scripture speak of the substitutionary death of Jesus for the elect as Christ being damned? is this just cultural contextualization? is it emotionalism run amuck? shock the flock nomenclature designed to wake up tired ears? is this sound doctrine, theatrics, dramatics, blasphemy, or truth? …While I appreciate the ministries of CJ and Piper, God’s truth is preeminent over any person’s individual proclivity to be clever. None of us can assign new meaning to words about the nature, person, character and ministry of the Lord Jesus Christ that the Scriptures have not assigned to Him already. To say that Jesus was Damned on the cross, is unbiblical and quite honestly, irresponsible. 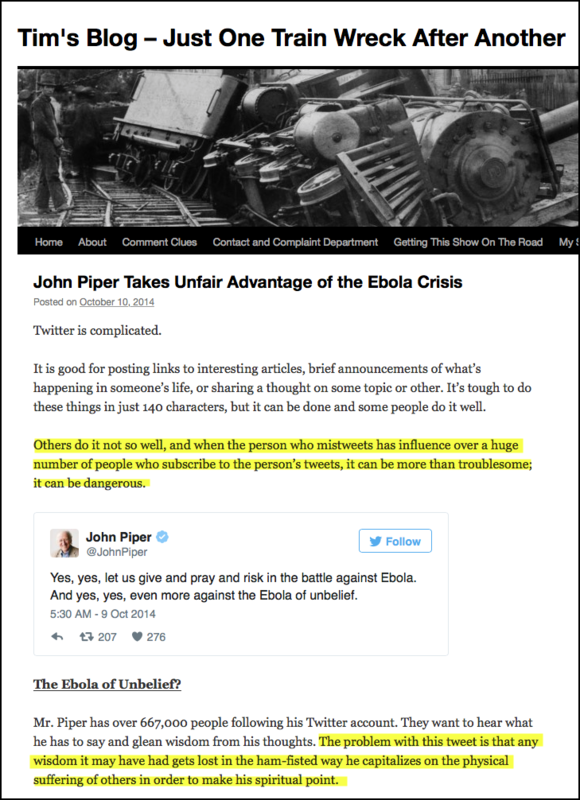 Tim Fall wrote an insightful article taking Piper to task for a tweet he wrote on the Ebola crisis. The complete article may be found here. Below is a tweet that Piper wrote in response to a deadly tornado that struck Oklahoma. I guess it passed his “functional authority” test. After the Piper tweet, Zack Hunt wrote the blog below in response. 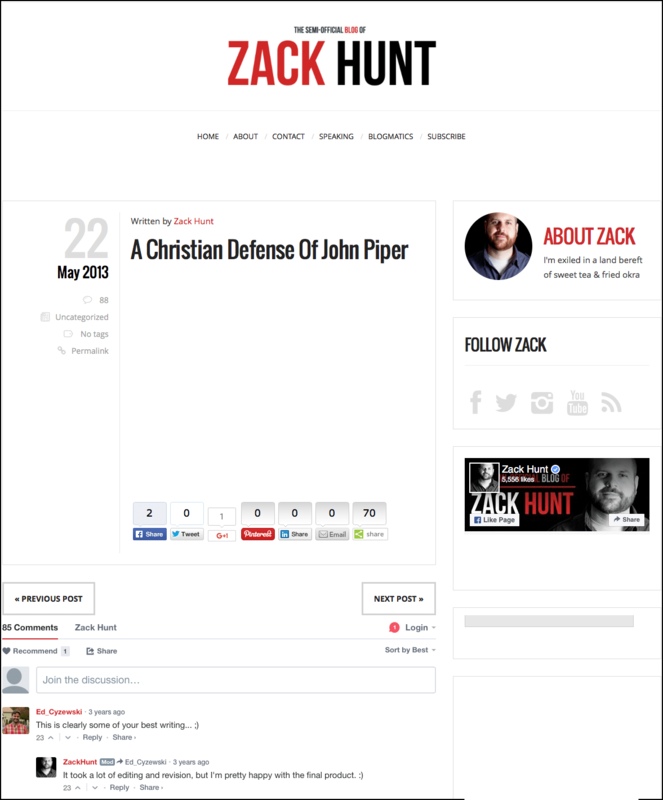 It took me a few attempts to reload the page before I realized Hunt was brilliantly stating, through the use of a blank page, that there is no Christian defense of what Piper had tweeted. You can read the blog here. “I knew it was coming: the Piper tweet, this time quoting Job in response to the Oklahoma tornado. As the dean of the neo-Calvinist movement, John Piper likes to push the envelope with his commentary on God’s role in natural disasters. He did it about a year ago when tornadoes hit the midwest. In 2007 after the Minneapolis bridge collapsed, he wrote that he and his daughter discussed how God must have done it so the people of Minneapolis would fear Him because our sin against God is “an outrage ten thousand times worse than the collapse of the 35W bridge.” Piper would say that he’s just being Biblical and that it shouldn’t be surprising that speaking Biblically would make people feel uncomfortable. So how do we talk about God’s role in tragedies? 2. Are muscular women are outside of God’s will? “Consider what is lost when women attempt to assume a more masculine role by appearing physically muscular and aggressive. It is true that there is something sexually stimulating about a muscular, scantily clad young woman pumping iron in a health club. But no woman should be encouraged by this fact. For it probably means the sexual encounter that such an image would lead to is something very hasty and volatile, and in the long run unsatisfying. I believe Piper’s response to the election question was cruel. I believe this discussion of muscular women to be bizarre. My husband spends a lot of time telling all of his patients to exercise. He is a cardiologist and it is well known that an exercise program strengthens the heart (Note to Piper: The heart is a muscular organ). And of course Piper loves Mark Driscoll’s theology! I got to thinking, the next time severe weather is threatening your neighborhood, it might not be a good idea to be hanging around a Baptist church, seeing as all the sexual abuse they cover-up, and many of the abusers are pastors! I find his Ask Pastor John podcast series to be fascinating. He is now 957 episodes (!!!) into his quest to provide advice on every conceivable topic known to man. As you would expect from Piper, some of his answers are reasonable, some are strange/confusing, and some are very troubling. Much like his tweets, he seems not to put much advance thought into the potential impact of his responses to the questions on his podcasts. I believe he has said that he does not usually review the questions prior to recording- it is perhaps not a coincidence that many of his most controversial statements have been made on the podcast. (For instance, his statements that wives may endure abuse “for a season”, that women should not be police officers, or that God can be glorified through genocide, to name a few) Of course, I’m sure he would say that he is only offering pastoral advice, but he must be aware that many of his followers will take his words as authoritative. Thanks, Edward. I just want to say that Piper has repeatedly made his statements about women needing to put up with being smacked around by their husbands on several different forms of media including video interviews. In other words, it wasn’t just a one-time thing he blurted out on a podcast or something of that nature. His initial “endure abuse for a season” remark was in 2009. Four years later he “clarified” it but it was still a muddled mess. If a woman is abused you should NOT give them a long winded diatribe on when and how to submit, they should be told to flee and find protection. After four years of blow back and time to think about it, Piper was still trying to shoehorn his insistence that women be submissive, if not to their abuse husband then somebody else. Thanks, I saw the video in which Piper said women shouldn’t report being socked to the police because then the husband might go to jail. Piper thought that the battered woman in question should expect the Godly men in the Church to ask her husband to quit smacking her around. In other words, he took his reasoning further than his original more vague “endure a season of abuse comments” by outright saying that a woman should tolerate being physically assaulted. I should clarify that I was not at all excusing his comments because they were “off-the-cuff”; I was offering the example of his podcast because I think it exemplifies his consistently poor judgement and lapses in empathy. Obviously, neither of those are ideal qualities in a pastor, even you leave aside his eccentric theology. Piper is the scariest charlatans out there, imo. He really believes what he teaches and does is controlled by God. He is a professed Christian but really operates in more of an Islamic paradigm. Our family has dealt with zombie Piper followers out of college who went to study with him years ago after Wheaton. I see now, they actually needed cult exit counseling but we really had no clue at the time and thought they would outgrow it. That was almost 20 years ago but when I started tracking Piper. The Piper followers will swoon at such lofty teaching. But does it make sense? I was thinking of airplanes earlier. Can you find me a verse supporting airplanes or contrary to airplanes? Remember, he said ‘every thought’. Classic Piper. He is so ridiculous people buy it as spiritual. This is classic Piper. The young passionate types never stop to analyze what he teaches. He is mesmerizing (if you like that sort of thing…I am much too pragmatic) and has many of the characteristics of Thought Reform going for him. So, he did not exactly follow his own advice in propping up Mahaney. But then, he gets to interpret for himself AND others what scripture teachers. I think your analysis of Piper is good. If he is mesmerizing, I think it is mainly among men in their early 20’s. I really don’t see many women of any age swooning over him. My feeling is that he takes himself way too seriously, a rather common trait among his celebrity pals. After years of being surrounded by young men constantly telling him how great he is, I guess it’s easy to start believing it. I find it hard to listen to him, it took me several sessions to get through this pearl. Seriously? With some of the dumb things that cometh from his mouth and pen? Endure abuse for a season? If his words were just misspeak it would be bad, but if they follow “analysis” then it is much worse. I am truly mystified that he has such a following. I seriously think that Piper has dementia or some other mental disorder. I don’t mean that as an insult in any way. What’s coming out of his mouth is incoherent at times. I was a member of a PCA church (whose members, at least in that church, tend to view all writings of Piper as holy writ) and I think I first started giving Piper the side eye when I heard this from 2009, where he explains the reason he doesn’t allow women to read scripture or lead a prayer from the pulpit in his church. Apparently, he views that as a place of “authority”, so women are forbidden. These pastors sure are obsessed about their “authority”. I have a few more comments, but must run at the moment.